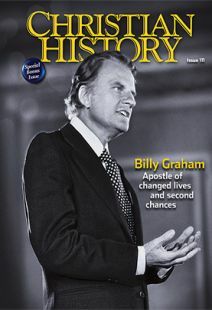 BILLY GRAHAM THE WORLD-FAMOUS evangelist was also Billy Graham the lifelong learner. Dissatisfied after one semester by what he saw as the cultural and religious rigidity of Bob Jones College, he transferred to Florida Bible Institute. He could have launched his preaching career from there, but Graham wanted more, and he decided on Wheaton College, a premier evangelical institution. After Wheaton Graham entertained the idea of further study. At the urging of his friend Charlie Templeton, he considered a Princeton seminary education. Graham even proposed they forgo Princeton and continue their studies at Oxford University. Graham did not go to either Princeton or Oxford, but the questions raised by the prospect of critical study of Christianity and the Bible followed him anyway. The most widely known moment when Graham wrestled with faith and reason was his storied mountaintop experience just prior to the Los Angeles crusade of 1949. In California’s San Bernardino Mountains, Graham went through a crisis of doubt provoked by Templeton’s urgent questions. Graham emerged from a prayerful walk in the pine forest with faithful certitude in the truth of the Bible and the way of Jesus Christ. Newly convicted he launched a career free from agonizing intellectual questions about the truth of the Christian faith. At points in his career, this led Graham to occasional damning statements about intellect that brought on charges of anti-intellectualism. Yet, for the balance of his six-decade ministry, Graham focused substantial energy on the importance of education and ideas, which opened up avenues of inquiry for him and countless other Americans. Graham’s interest in the life of the mind placed him in the company of the New Evangelicals, a group led by the likes of Harold Ockenga and Carl Henry who sought an intellectually rigorous middle way between archfundamentalism and archliberalism. Out of that vision, and with the funding and influence of Charles Fuller, Fuller Theological Seminary was born in 1947. Graham was an early and ardent supporter. His interest in Fuller grew more pointed during his time as president of the Northwestern Schools in Minnesota (1948–1952). After all, he had charge of young students, some of whom would want to attend seminary. In 1956 Graham joined Fuller’s board of trustees. That experience prepared him, with Ockenga’s help, to found Gordon-Conwell Seminary in 1969 and serve as the chair of its board. The seminary’s swift growth in student body and prestige made it an East Coast complement to Fuller. Graham also considered establishing Crusade University in the late 1950s and Billy Graham University in the late 1960s. In both cases, plans were drawn up, curricula developed, and funds solicited. But Graham backed out of these ventures, for fear that they would divert his energies from evangelism. Though Graham never founded a university, his publishing activities indicate his clear interest in shaping evangelicalism’s style and content. From the first of his 32 books, Peace with God (1953) to the last, The Reason for My Hope: Salvation (2013), Graham was consistent with the moderate conservatism of the New Evangelicals. He encouraged a born-again, thoughtful, and socially responsible faith, neither dogmatic nor indefinite. This attitude suffused his syndicated column, which reached millions of Americans and taught the nature of “new evangelical” Christianity. 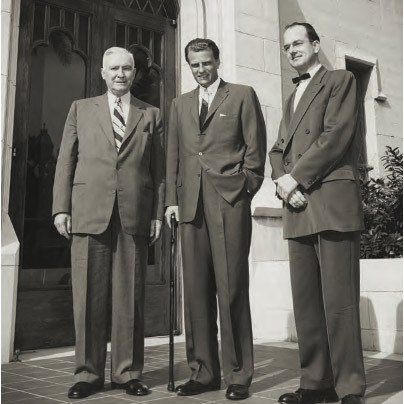 Backed by the influence of Harold Ockenga and Graham’s father-in-law, L. Nelson Bell, Christianity Today exceeded the Christian Century’s circulation within weeks. The magazine published authors who shared a predominantly charitable, yet rigorous, Christian voice—attuned to the strengths and weaknesses of both fundamentalists and liberals. Graham’s desire for “intellectual respectability” and his interest in a middle course through the theological landscape also drove his many visits to colleges and universities of all types—church related and secular, liberal and conservative. Most conspicuous were repeated trips to such bastions of secular scholarship as Harvard, Yale, Oxford, Cambridge, and the University of California, Berkeley. Graham went to such places ostensibly to give lectures, but in reality he gave sermons, omitting only the altar call at their conclusion. Inevitably, he won respect—sometimes begrudging—from students. He did so by indefatigable charm and sincerity, but also by giving an unflinching and genuine articulation of the Christian gospel. He turned the halls of learning into unlikely settings for a lesson in evangelical preaching. A few years later at Harvard, one of the chaplains introduced Graham but could not resist a critical word: “I cannot agree with all that Dr. Graham says. His biblicism troubles me a bit. When he says ‘the Bible says,’ I wish he would get on to talk about Christ and leave out the rooting of his authority in the Bible.” In his opening remarks, Graham replied, tongue-in-cheek: “I want to turn to the Bible, if I might, to find a quotation of Jesus because I don’t know of any quotations of Jesus outside of the Bible.” The audience burst out in laughter and warmed to Graham immediately. Graham’s growing print empire and his unquestionable influence commanded the attention, even the respect, of intellectuals. He certainly caught the attention of prominent theologian and political philosopher, Reinhold Niebuhr, who both praised and criticized Graham in a series of articles between 1956 and 1958. Their print relationship never became a personal one, though Graham and Niebuhr were both invited to participate in a forum on “Evangelism in Our Time” at Princeton University in December 1956. Graham attended, but Niebuhr did not. Others who joined the forum included John Stott, rector of All Souls Church, London; John Mackay, president of Princeton Theological Seminary; Paul Lehmann, then a professor at Harvard Divinity School; Theodore Gill, managing editor of the Christian Century; James Jones, Union Seminary in Richmond, Virginia; and Sidney Lovett, chaplain at Yale University. Graham’s connections to accomplished academics stretched beyond this group to other theological heavyweights from America and Europe, including Karl Barth, Emil Brunner, and Helmut Thielicke. These thinkers hardly embraced Graham uncritically. Barth, for example, lectured at the University of Chicago during Graham’s 1962 Chicago Crusade. He endorsed that effort but also told reporters that “mass evangelism is not for me,” explaining that he and Graham had breakfasted together and that he told Graham: “You point a pistol at a man’s breast. I prefer a more inviting approach.” Still, Barth and many theological colleagues agreed that Graham authentically represented the gospel message of sin and salvation. Andrew Finstuen is dean of the honors college at Boise State University. He is the author of Original Sin and Everyday Protestants: The Theology of Reinhold Niebuhr, Billy Graham, and Paul Tillich in an Age of Anxiety.